As we attempt to navigate the ever-expanding seas of data in the information economy, we can overlook the extent to which data streams run underneath the world’s seas to create a quite concrete sense of the interlinked. For such cables underlie the increasing notion of geographical proximity we experience daily, from the world of big finance to mundane online transactions. The spans of privately funded fiber optic undersea cables that have been lain across oceans floors, some stretching over 28,000 kilometers, provide an image of global circumnavigation as well as offering the most massive engineering feat on earth that is hidden to human sight. And the rapidity with which further cable is being lain to link the world’s data flows along faster and more secure lines of communication provides a telling model of interconnectedness–suggesting new senses of connectivity and warping past concepts of proximity, and unifying the differently owned cables as if a coherent and open information highway. The antiquated format of charting used in the above map suggests the increasing interconnectivity of the Information Age, as well as it coyly reveals the ways that TeleGeography, a global telecom, has pioneered ways to channel information across seas–and done so by familiarizing viewers with a distinctly concept of space. Rather than naturalize an image of high-speed connections, the clever choice to rehabilitate a slightly romanticized earlier mapping of oceanic expanse suggests the new space of online data. And it takes the notion of the electronic frontier seriously, by seeking to orient viewers to the new mental space that such sunken data lines create. If the map of the bridging of oceanic by sunken internet cables domesticizes the transcendence of distance through the increasing interconnectedness of information flows. The retrograde mode of mapping also reveals the actual distances that the physical substrate of the World Wide Web inhabits in so doing, and suggests that we would do well to remember the physical substrate by which the global financial economy is interlinked. The shrinking of distances was a powerful breakthrough of the ability to map space in different metrics, however, than every seemed possible for transatlantic travel. 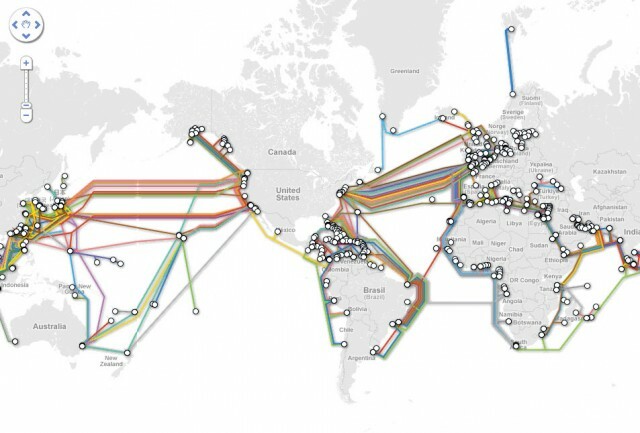 And its apt that the antiquated techniques of mapping global relations were reprised by the folks at TeleGeography to remap the current global growth of internet cables by the syntax and aesthetics from an Age of Discovery. The appealing charting of the hidden network of submarine cables designed by TeleGeography didn’t only borrow the antiquated iconography of marine charts from an Age of Discovery in order to promote the expanding spread of submarine fiber-optic cables in amusing ways. For the image served to suggest the shifts in spatial connectedness that such increasingly rapid data flows have allowed, and to suggest a map that, in focussing on the seas–and the overlooked areas of marine space–returned to an interesting if somewhat overlooked spatial metaphor to consider and visualize the extent to which global financial networks and information systems move in particularly flexible ways across the permeable boundaries of nations, if not the degree to which national units have ceased to be the confines that matter, as cross-border flows are increasingly the primary sorts of traffic that matter to be mapped. A more familiar global remapping of phone calls,constructed on a study by students of business, Pankaj Ghemawat and Steven A. Altman, partly funded by the logistics firm DHL, an approximate quantification of globalization was made by the metrics of cross-border telephone calls in 2012 worldwide, in which the thickness corresponds to the minutes spent on the phone–and presumably the closeness of connections, if filtered through the relative costs of calls and the ability to pay them. In a sense, the chart featured by TeleGeography openly incorporates less data, while noting the varied speeds of connections, in an image of interconnectedness, and positions itself less as a cutting edge snapshot of globalization or globalized than at the dawn of the possibilities of future interconnectedness that the laying of fiber-optic cables of greater speed can promote. If the map of telephone calls raises questions of information flows, some 41 percent originating in what the authors identified as “advanced economies” to “emerging economies,” and only a small fraction (9%) originating in an “emerging economy,” the technology may also illustrate the precise demographic that continue to adopt telephony: the authors observe that the dominant “calling patterns” reflect “interactions due to immigrants,” with most international calls being placed from the United States to Mexico and India, countries of first-generation immigrants–rather than reflecting actual information flows. –but a smooth surface of cables that seem to be lain without ever encountering natural obstructions or topographical variations in the ocean floor. 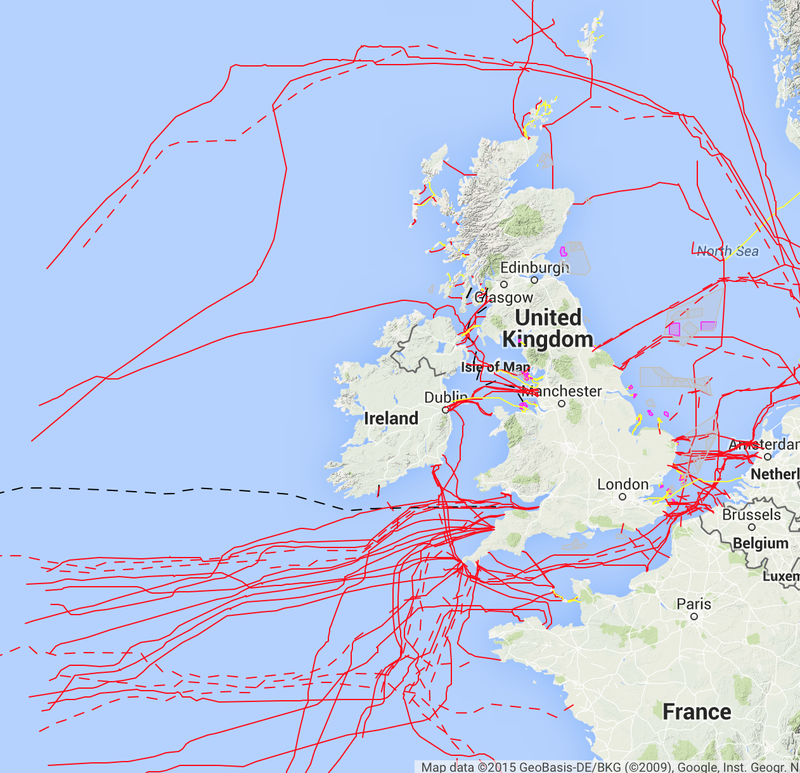 The submarine network now totals upwards of 550,000 miles. Although it is never seen above ground, and lies concealed beneath the seas, it now seems to animate most international commerce. There is a pleasant irony in adopting the decorative aspects of marine charts to map a contemporary image of global circumnavigation, since they gesture to deep shifts in the seas of information, but also evoke the marvel of rendering visible what is all but unseen. The exact locations of such cables are not displayed, of course, but the stylized presence suggests a decidedly early modern form of boastfulness–“according to the best Authorities [and] with all the latest Discoveries to the PRESENT PERIOD,” the extent to which the infrastructure of the Information Age spans the seas. What once was a site of marvels revealed by the officer turned conservationist Jacques Cousteau is a field for information carriers, even if monsters inhabit its depths. 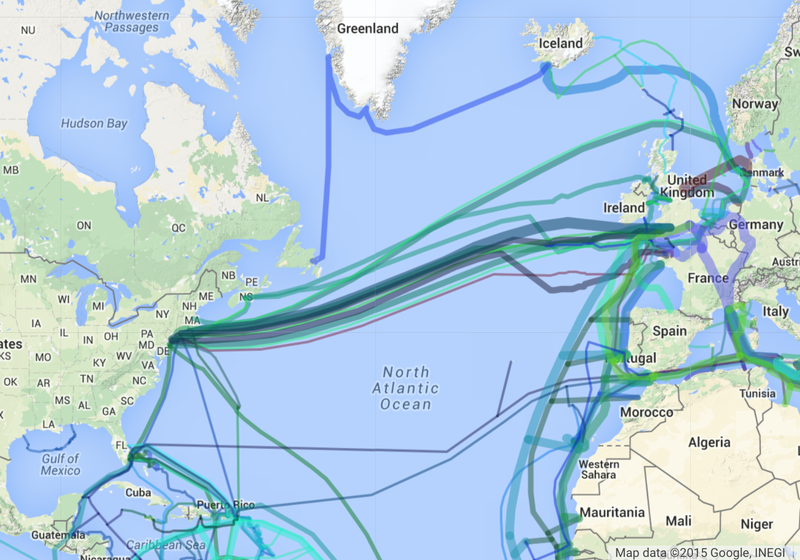 The “New Map” updates the recent rapid exponential expansion of the network fiber optic cables in recent years as a sort of corporate promotion, rehabilitating the marine chart to naturalize the submarine network that now carries a large share of global financial and administrative information worldwide. Retrospectively mapping the expansion of this exoskeleton of the anthropocene ignores the technologies on which such mapping suggest, recalling the abilities to technologically harness steam, wind, and power to recreate the romance and adventure of global circumnavigation in an updating of the 1873 romance and fast-paced adventure Jules Verne told of a race against the mechanized clock by a constellation of transit networks. 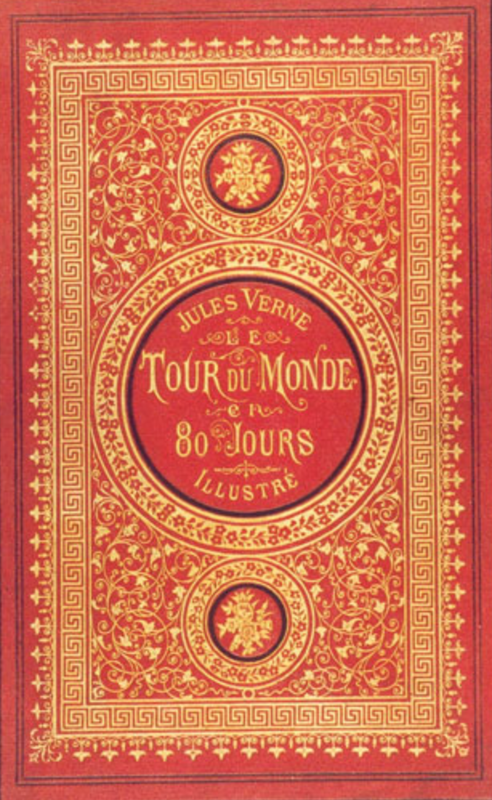 For much as Verne offered a quickly paced adventure mildly disguised celebration of technological unification of the globe, the retrograde if glorious map masking as an engraved superimposing high-fibre cables on image of the ocean as understood in days gone conceals the clear corporate interests or material technology that underpin the Information Age. The work that the map modeled after an engraving of global seas does is serious, for it integrates the growing network of fiber-optic cable at the ocean’s floor into the seascape that nautical charts showed as a light blue watery expanse. For as the price for fiber-optic cables precipitously dropped since 2000, this material infrastructure of global financial markets has not only grown, but kept up with the rapid improvement in network communication along a growing network of 250,000 km of submarine cable most folks have limited knowledge, and whose public image is in need of PR. The addition of such fairly florid decorative detail from nautical charts to invest the routes of hidden submarine cables’ with an aesthetic that both caused it to be named one of the best maps of 2015 and exemplifies how to lie with maps. The 2015 map, published online, but emulating the paper map, seems to conceal the extent of work that went into not only laying the cable, but ensuring that it was not disrupted, but blended seamlessly into the surrounding submarine landscape. FLAG–the Fiberoptic Link Around the Globe–after all offered a sort of modern updating of the boast of Jules Verne’s Phineas Fogg. For Fogg wagered £20,000 that the speed of the combination of trains and steamboats would allow him to travel around the globe so that he could return to the very same seat he occupied in the Reform Club in London in only eighty days–a boast based on his trust in the speed of modern conveyances of steam travel. For Fogg’s image of interconnectedness was realized in the copper cables that conducted telegraphy traffic. These telegraphy cables lain under the Atlantic by the 1880s by the Eastern Telegraph Company across the Atlantic and Pacific, which by 1901 linked England to North America, India and Malay in a network of communications that offers a vision of corporate interconnection spanning the expanse of the British Empire and providing it with an efficient communications system that was its administrative and commercial underpinning. But rather than perform the feat of circumnavigation, the matrix of underwater internet cables is based on the creation of a submarine matrix to carry any message anywhere all the time–when it can be linked to an on-land cable–save, that is, in Antarctica, where the frigid waters, for now, would freeze the cable and disable it. Fogg staked his wager after noticing a map showing the construction of British rail exchanges that allowed long-distance transit across India, believing in his ability to achieve global circumnavigation on a network of carriers, based on his trust as a passenger and subject of the British Empire–and the infrastructure the enabled news, commerce, and administrative connections to travel with velocity, leading twenty-four of the thirty ships capable of laying cable-laying to be owned by British firms by 1896. 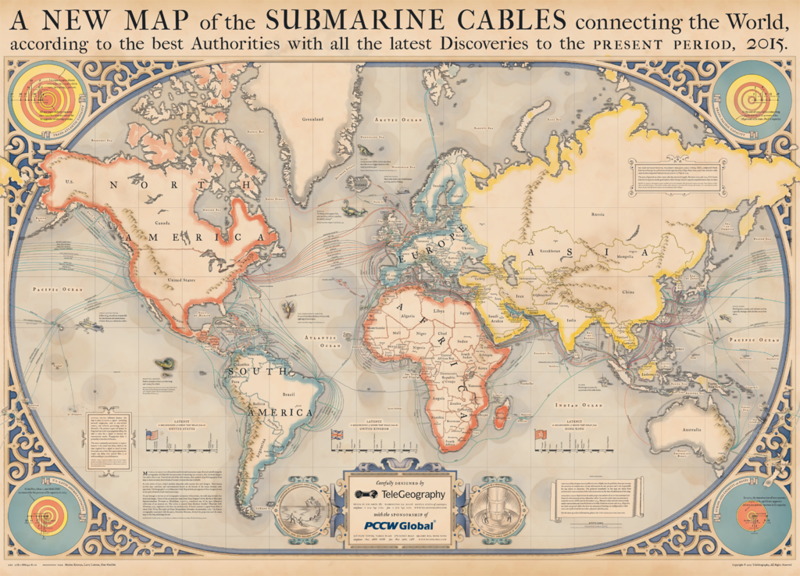 The framed cartouche in the upper right of the 2015 Submarine Cable Map echoes the triumphalism of the “present day” in boasting of the achievements by which, since “the first intercontinental telephony submarine cable system TAT-1 connected North America to Europe in 1958 with an initial capacity of 640 Kbps, . . . . transatlantic cable capacity has compounded 38% per year to 27 Tbps in 2013,” as US-Latin American capacity has nearly quadrupled. The map, revealing the material network to what most of us perceive as coursing through the air, less effectively places the course of cables in evidence than depicts their now naturalized course. The seascape of the Information Age seems, indeed, to demand the naturalizing of the courses of submarine cables, shown as so many shipping lines, running across the Atlantic and to the Caribbean, around the coast of Africa, from India to Singapore and to Hong Kong and Japan, before coursing across the Pacific. Is its quaint cartographical pastoralization of the courses of communication under the oceans, we see a reverse rendering of a materialized image of globalization, disguised by a faux nostalgia for the mapping of the as yet unknown world that will be revealed by the impending nature of an even greater increase of data flows. Indeed, the breakneck speeds of data transport are noted prominently in some of the cartouches framed at the base of the map, which suggest the two-fold subject of the map itself: both the routes of cables that were laid on the ocean floor, and the speed of data transport their different latency allowed. The cartouche is a nice rendering of the corporate promise of delivering data that TeleGeography presumably makes to its customers, despite the different ownership of many of the stretches of cable that exist, and the lack of harmony, proportionality or geometric design in how the cables are in fact lain. That the network of submarine cable retains a curious focus on relays in England that is a telling relic of the nineteenth century. The internet’s network still seems to start in England in Porthcurno, moving to Spain and through the Strait of Gibraltar, across the Mediterranean to Alexandria and then turn down the Gulf of Suez through the Red Sea, and around the Arabian Peninsula to Dubai, before moving across the Indian Ocean to Bombay and on to Malaysia and through the South China Sea to Hong Kong and up the coast of China, it creates an even more expansive set of exchanges and relays than Fogg faced. For while Fogg was dependent on rail to traverse the United States as well as much of Europe, where he could pass through the Suez Canal to reach a steamer engine, and then cross India by train, before getting a ship at Calcutta to Hong Kong and Yokohama, the multiplicity of connections and switches that the submarine cables create disrupt any sense of linearity and carry information at unheard of speed–fiber-optic cables carry information at a velocity that satellite transmission cannot approach or rival. The relays of paired cables now enable the instantaneous transmission of information between continents realize a nineteenth century fantasy of an interlinked world in ways that expanded beyond contemplation, the possibility of visiting the countries that FLAG traces are actually verges on impossibility–if only since the network offers multiple pathways of simultaneous transit. 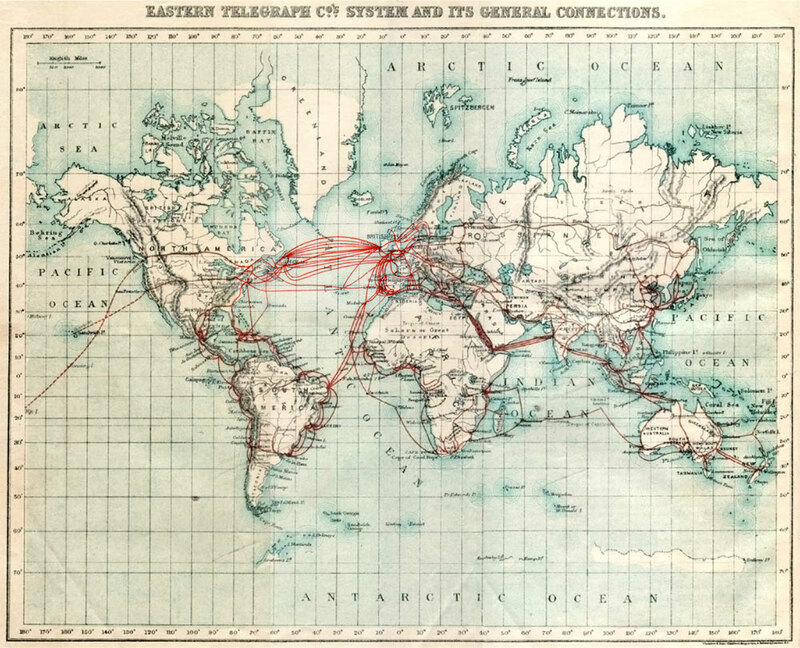 The ambitions of those earlier Telegraph cables in connecting the world far transcends Fogg’s plan to create a path by which he could move between transit hubs. His plans are dwarfed by the ambitions of modernity of the range of active and future underwater cable revealed in Greg’s Cable Map in ways that suggest the ambitions of creating an ever-more intensely interlinked world, where increasing number cables have been laid to fashion the actual physical infrastructure of the internet. We often render the “hidden world” of privately owned transatlantic and other cables as a separate underseas world of cables lying on the seabed, able to be disrupted at its nodes, but removed from alike the shoreline and terrestrial world. In strong distinction from such an image, the recuperation of something like nautical engraving by TeleGeography makes the clever point of naturalizing the greatest infrastructure of the Information Age–one that sometimes seems to have outweighed investment in the visible infrastructures of our cities and roads–within the currents of our seas, and as colored by the very hues by which the land is mapped as if to show the seamlessness of the communicative bridges that they create. Given the extreme overload of data that these maps reveal–and the eeriness of a world created by the extent of cable laid–It’s in fact quite apt that the telecom firm TeleGeography showcased the interconnected nature of global communications this year by adopting the style of nineteenth-century cartographical tools. It’s probably not at all a coincidence that in this age of big data, there’s a deep romance in the symbolic reclaiming of the crisply engraved lines of nineteenth-century cartography that folks like Nathan C. Yau of FlowingData pioneered in the online publication of a Statistical Atlas of the United Sates with New Data, refiguring information of the 2010 Census and 2013 American Community Survey. Although designed in bits, the maps emulate the engraved delineations created for Francis Amasa Walker’s first Atlas: Yau announced he had done out of some disgust that budget cuts prevented the Bureau of the Census from creating the atlas displaying its data in a Census Atlas–despite its success in accumulating so much data. 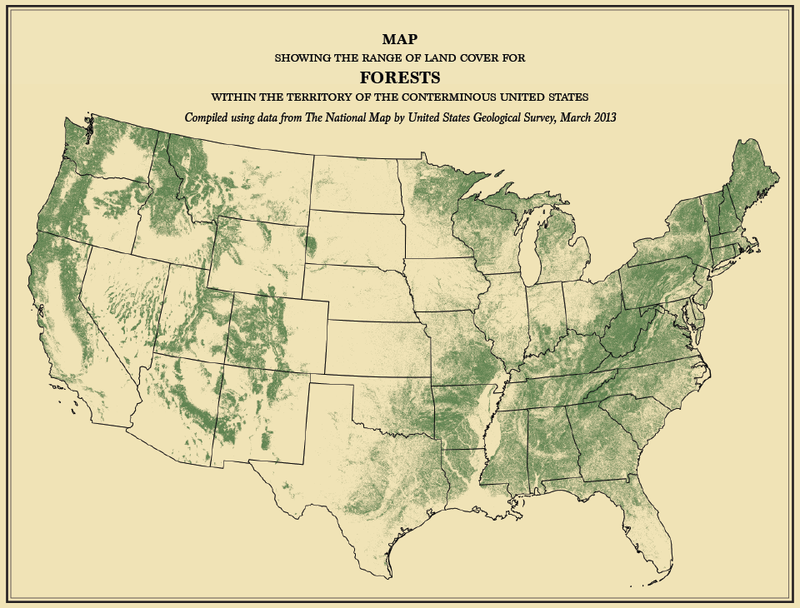 A quite clever graphic designer, Yau has posted sequences of detailed non-dynamic maps that evoke the lithographic detail and crisp objectivity with which Walker created multiple legible embodiments as the Director of the US Census from 1870, when his interest in data processing led a set of new maps of the nation to be printed in Harpers Magazine, and the Census to grow to 22 volumes. So well are we trained in grasping information via elegant visual forms that Yau bemoaned the absence of a similarly set of stately maps by evoking the project Walker envisioned as a form of mapping serving the public good: and his online images embody data lying in the repository of Census data, from geological records to the distribution of human populations–and digest data to recognizable form, whose individual snapshots seem a nostalgic embodiment of data available from the American Community Survey. It is somewhat less expected that the format of an engraved or traditional map be showcased to reveal the system of submarine cables lying on the ocean’s floor: few would consider the invisible network with nostalgia for the medium of the paper map. The decision to “go retro” breaks conspicuously with such a choice for the futuristic design, and accommodates the multiplying extent of fiber optic cables that have been laid across the world’s waters so as to network the globe. 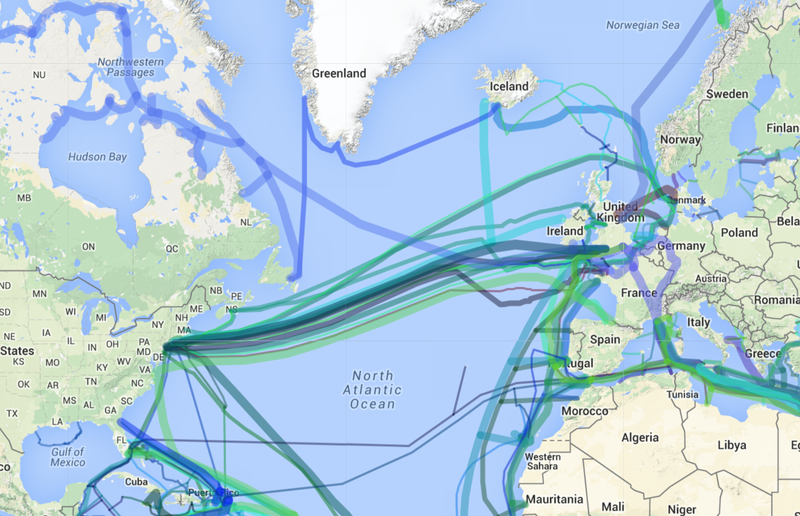 Only in 2014, TeleGeography issued a staggering map of the improvements in linkages of relays in submarine cable systems, suggesting the extent of the interlinked world to which we have become familiar not only thanks to Edward Snowden, but to our reliance on global data flows that increasingly enable financial markets worldwide, surpassing material constraints. Such a map is overly schematic, indeed, since many of the cables’ paths are not openly disclosed. From the land, we cannot see the landing sites where such fiber-optic cables go underwater, as Trevor Paglen has recently reminded us, in a series of diptychs that contrast the cables barely concealed in NOAA maps and the otherwise placid landscapes of the beaches beneath which they run; few realize the extent to which the information that travels on them is likely to be monitored as a form of mass surveillance, which we are far more likely to associate with satellites or surveillance. But the complexity of the how information is carried along such cables is as boggling to the mind as the awesomeness of its ambitions. 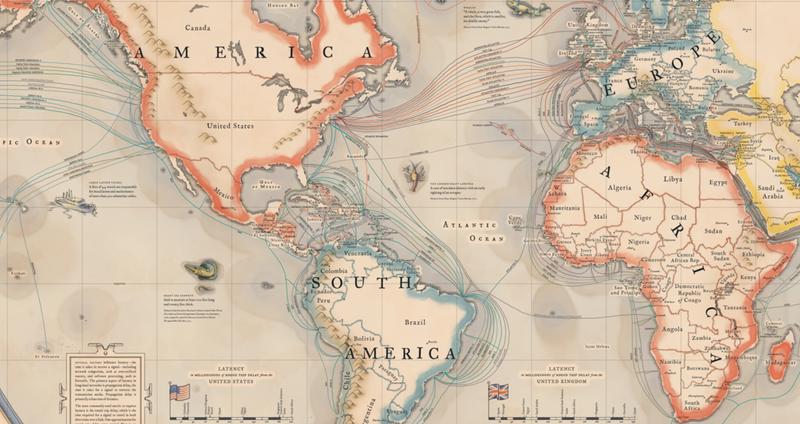 Perhaps recognizing the sense of overwhelming its readers with data overloads in its maps, the 2015 map of submarine cables from Telegeography updated the format of an engraved map, and put in online in a fully zoomable form, to allow one to examine its lovingly rendered detail in a map that harkens back to charts of nautical discoveries but celebrates the rapidity of delivering information in an updated version of the corporate triumphalism of the Eastern Telegraph Company. That map, which boasts in evocative language to be revised “according to the best Authorities with all the latest Discoveries,” foregrounds the multiple linkages of fiber optic cables that carry the vast majority of communications–of which “oversea” satellites link but a fraction–so efficiently they at first carried upwards of a thousandfold as much data compared to the older copper cables that lay below the sea recently–280 Mbps of data per pair–and moved 100 Gbps across the Atlantic by 2012–and the prediction 39 Tbsp is even feared to barely satisfy demand. For transatlantic cable have come to carry some 95% of international voice and data traffic, and are viewed as a fundamental–if unseen–part of our global infrastructure, potentially vulnerable to disastrous interruption or disruption. The familiarity of the “New Map of the Submarine Cables connecting the World” is not only charming; it is a somewhat subtle naturalization of the new materiality of information flows so that they are regarded as a part of our new lived environment. To be sure, the paths of cables are highly stylized, as if they fit within the oceans’ currents, although they sacrifice accuracy even though they suggest their private ownership and considerable density. 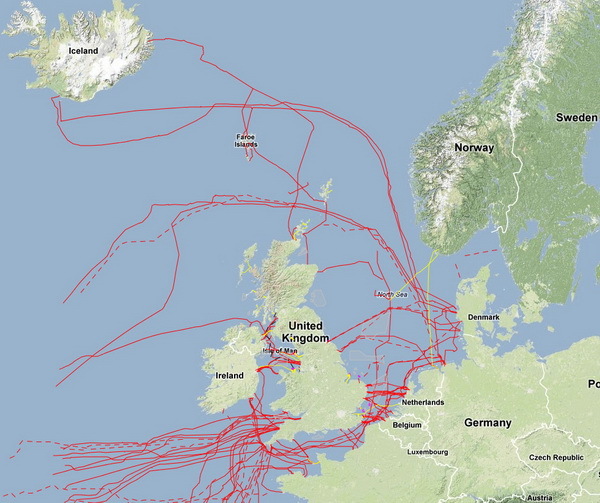 The open-ness of this mapping of submarine cables has been rare until recently–as recently as 2009, the location of the cable that arrives in the UK at Cornwall Beach was kept secret even on military maps, although commercial fishing trawlers and other boats are provided with access to them, somewhat paradoxically but unsurprisingly, lest they run across and damage the undersea cables that relay so many vital data flows across the globe under the seas, and whose severing could potentially come at a cost of as much as $1.5 million per hour. The actual density of such cables laid at the bottom of the sea is not displayed on the above map, of course, which conceals their precise locations or the complexity of their routes, which are tantamount to secrets of state and off most maps. Decidedly fanciful if naturalistic sea monsters could denote the limits of the known world or the boundaries of secure navigation in many early modern charts, the inclusion of this most pictorial of cartographical iconographies familiar from early engraved maps are aptly appropriated to suggest the absence or gaps in the interlinked nature of space and of what passes as our sense of continuity in 2015–as well, on a not so subliminal level, to evoke the dangers of their disruption. So naturalized is its cartographical iconography that the map suggests the new environment of internet cables in which we live. This naturalization might be nowhere more evident than in the exotic appearances of marine creatures included in its seas. 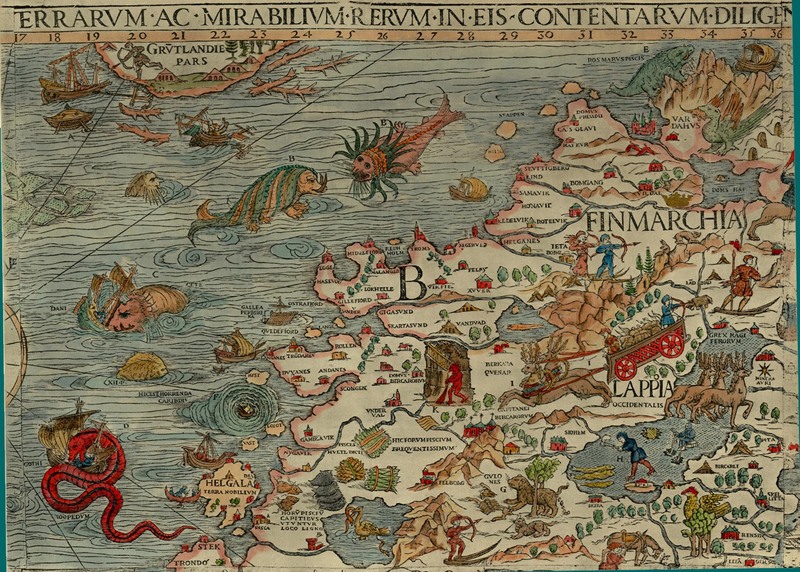 A longstanding historical association exists between sea monsters with the North Sea, after monsters were first rendered as crowding its overflowing oceans in glorious detail by the bishop-geographer Olaus Magnus in his 1539 map of the land and waters around Scandinavia, who seems to have borrowed from bestiaries to illustrate the dangers that sailors would face in its waters, and to delight his readers and attest to the variety of the created world. A strikingly similar sort of horned seal and spouting fish quite appropriately make an appearance in the 2015 Submarine Cable Map of TeleGeography within the North Sea and Arctic Ocean, as if to suggest the frigid waters that restrict the services such cables deliver–the spouting animals and seal lifted from Olaus Magnus’ Marine Chart frolic just beyond the regions that are currently covered by the cables’ crowded course. Is this a hidden representation of what actual spatial limits constrain where countries are able to lie further submarine cable?